The newly formed All Party Parliamentary Group (APPG) for Working at Height, sponsored by PASMA and chaired by Glasgow Central MP, Alison Thewlis, has launched its first inquiry into the numbers of serious injuries and fatalities which occur because of a fall from height and falling objects. The inquiry is be open for evidence submissions from interested stakeholders until March 2nd 2018. The APPG will have two days in Parliament to consider evidence – following that, they will develop a report to make recommendations on how the frequency of serious injuries and fatalities can be reduced. In 2016/17, 18% of those who died at work did so as a result of a fall from height. PASMA, together with the Access Industry Forum (AIF) – the forum for the eleven leading trade associations and federations involved in work at height (including the Ladder Association) – believes that there are many issues that need to be urgently addressed to reduce these figures. These include: better collection of statistics relating to workplace falls; more in-depth investigations; raising awareness of the dangers of working at height; and the need to choose the most appropriate piece of access equipment for the job. 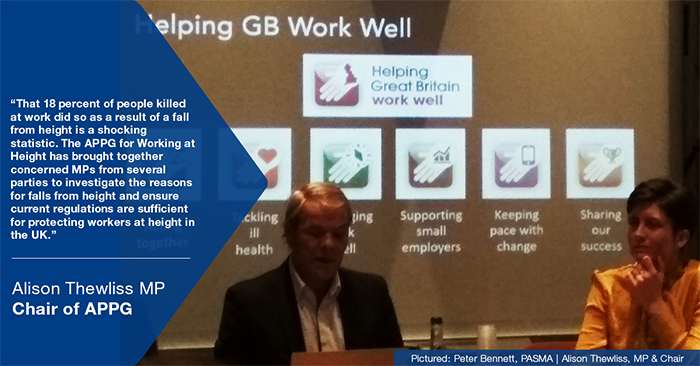 Peter Bennett, Managing Director of PASMA said: “Although the number of overall workplace deaths has decreased since 2015, nearly one in five of those who lost their lives last year died because of a fall from height. “PASMA and the AIF are glad to support the work of this new APPG which aims to study and examine the reasons for falls from height in the workplace . We look forward to seeing its recommendations to the Health and Safety Executive on how the number of people and families affected by falls from height can be further reduced.